Laura in her beautiful, natural light, studio. With an appreciation for modern design and a dedication to craftsmanship, Laura Jaklitsch fabricates each piece by hand in her Somerville, MA studio. Using her signature inlay technique, Laura experiments with material, color, and form to make jewelry that is fresh, contemporary, and bold. She lets the process direct the work, while making deliberate color and composition choices. 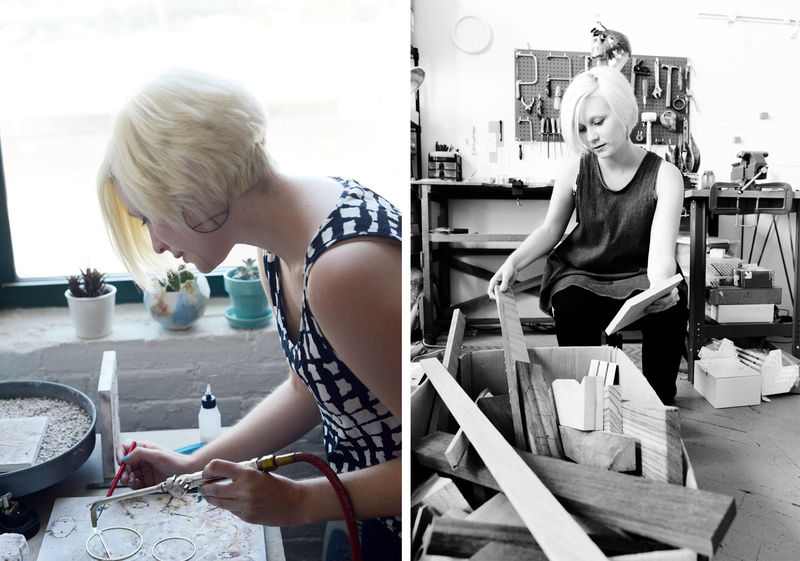 Laura uses recycled metals and repurposed wood wherever possible to maximize sustainability. I am a jeweler who makes one-of-a-kind wearable works of art. I think I started selling my work around 2012? 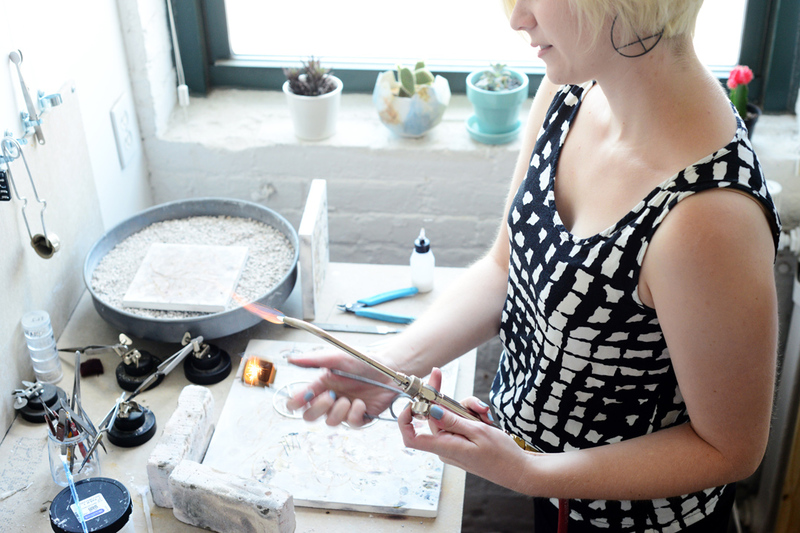 I wanted to work for myself doing something I love and use the skills I have honed in my 12 years of making jewelry. What did you used to do before this? I have a BFA in Jewelry in Metalsmithing from Massachusetts College of Art and Design, and after school I worked in the jewelry industry, as a bench jeweler and doing cosmetic restoration of high end swiss watches. Balancing working multiple jobs with creating new work. The jewelry work of Laura Jaklitsch. The growth in my work and development of my artistic voice & vision. Who are three creative-types or businesses that inspire you? I know so many inspiring makers it’s hard to pick – the creativity and generosity of the craft community is amazing. The drive to keep making – creative grit? Anything else you would like to share with everybody? You can find me in Studio #31 and on the web at laurajaklitsch.com and @laurajaklitschjewelry. What are you doing when you’re not working: I spend most of my time working (an artists’ work is never done!) but I love to hang out with my dog and also try new recipes.